One of the scariest things in The Children is a crayon. 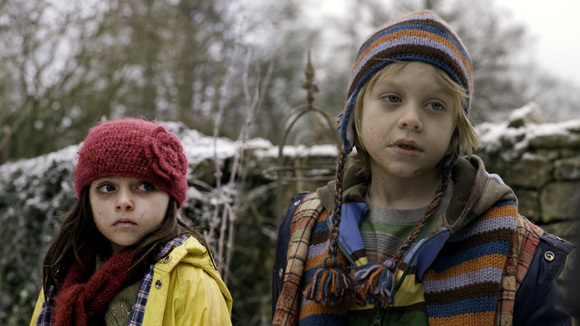 The spawn of ankle-biting chiller masterpieces The Innocents, The Omen and (sort of) Don’t Look Now, Brit writer/director Tom Shankland’s killer-kids horror is full of these delicious reversals. It makes wicked work of turning everyday objects into nerve-twanging threats: a sled, a tent, a toy cart, a climbing frame… Men are useless and the horny teenage girl (Hollyoaks’ Hannah Tointon) isn’t just sweet-meat for the grinder… And when the killing begins, the children let their parents take over the screaming and crying. They do that admirably, but it’s Shankland’s kiddie-cast who are key: all four of them nail the eerie, unknowable stares that hover between otherworldly innocence and chilly ruthlessness. Set entirely at a Christmas gathering between two families at a woodland house, The Children sees toddling younglings mysteriously fall ill before turning against their parents in lethal fashion. Despite the twisted images of birth and motherhood, there’s little substance to the story: it’s not much more than a celluloid shilling-shocker. But what makes it are Shankland’s cine-smarts and his undeniably visceral execution. Spiked with startling subliminal flash-cuts to a bloodied baby doll and a giant eyeball, it’s a tense dinner-table scene that triggers the bloody kidastrophe. After the grimy darkness of his agreeably nasty sub-Se7en mystery WAZ, Shankland gives us a rare daylight horror in the gleaming white snow. He also uses the primary colours of the children’s world as scary portents – red being the favourite from his palette. The effects are terrifically gory: a jutting broken bone here, a bloody flap of skull-skin there. Shankland also has great fun making the kids look like ominous giants with low-angle lensing, while dragging the grown-ups down into a world of knee-high horror. Shankland’s concussive use of sound and editing also makes for a couple of gripping set-pieces, hitting apex in a greenhouse ruckus that escalates into a razor-sharp chaos of broken glass, scissors and kitchen knives. The film originated from an idea by Paul Andrew Williams, writer/director of London To Brighton and The Cottage. Read the original article at SFX.